Alarm Clock with built in DVR and Wi-Fi is a portable talking alarm clock has 6 different alarm sounds, and snooze function with intervals of 1-60 minutes. 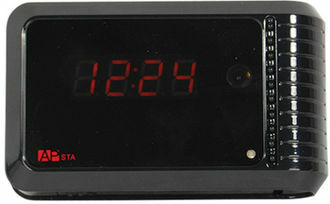 It has a digital display which shows the current time, year, month, and date. It comes with a suction cup holder stand or can be put right on a table. The Alarm clock recording resolution is (1280x720) at 30fps and will record to the internal DVR which has motion detection. 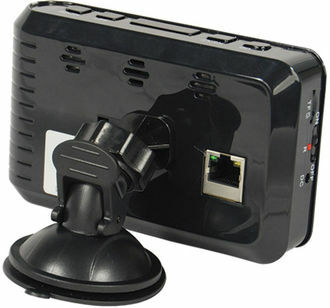 It has a 140 degree viewing angle to allow the widest video footage of most hidden camera. It also has 10 IR LED's that give you about 20 feet range of night vision. It has a very easy to set up Wi-Fi function. The first is Wi-Fi directly to a smart phone or smart device. No need for a router just connect to the Wi-Fi network the camera displays to your smart device and you can monitor the camera as long as you are in the Wi-Fi Range about 100 feet in an open area and about 30 feet through walls. The second way to connect and view the camera is to connect it to your network and you can view the camera from anywhere in the world using your smart phone or tablet. The app is easy to download from the app store and is used for both Wi-Fi functions. The app allows you to record video directly to your phone as well as view the camera from anywhere in the world.